Song of the day: Strangely Alright – "Train To Nowhere"
OK. I have another album to review, and this time I’m going to do my darnedest to keep this post at a manageable length. 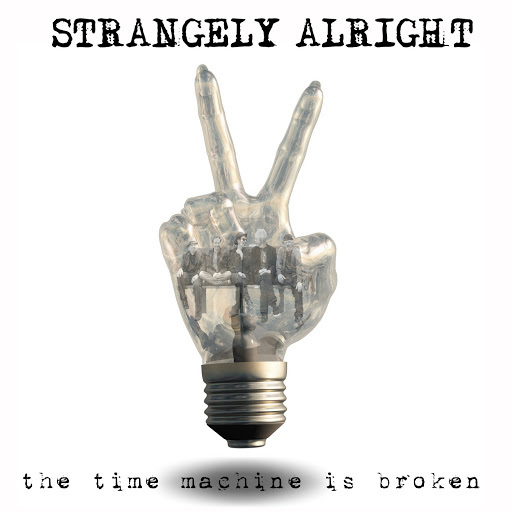 Strangely Alright is the band, and their brand spanking new album is called The Time Machine Is Broken. (Disclaimer: I don’t know if any spanking was involved.) I’ve been reliably informed (by Regan, the band’s leader – Hi, Regan!) that all the songs centre around the concept of time. Which would make it a concept album. But it’s not prog rock. Strangely Alright are a power pop band. 2. I like the reverb on the guitar. 3. It has some decent tunes. I like this. And I like the spy guitar from 1:09-1:14. I think I’m going to enjoy this album. Swampy. Sort of. At any rate, it reminds me of “The Honeymoon Is Over” by Australian band The Cruel Sea. The more I’m hearing it, the more I’m inclined to describe this album as “thoughtful”. It’s certainly not a “Hey! Hey! Let’s Party!” kind of album. Considering he’s singing about being stuck in traffic, I thought it would have been more accurate, instead of the “absurdities”, to sing about “the mundanities of daily life”. But then I got on board with the psychological milieu the song inhabited, because the singer was a-singin’ about dreariness, and I got the point. Plus the song had handclaps. 2:47-2:50 – Someone’s playing wrong notes, and I think it’s the bass player. 2:57-3:10 – I like the tune for the singalong here. 4:17 – That was a novel way to end the song. And so it goes with this particular song. For its entire duration I was resisting the urge to say “Cha cha cha” at the end of each line, which muddied my thoughts about it. My Thoughts About It: Cha cha cha. This album sure is nowhere near as lively as I was hoping it was going to be. I’m starting to think of words like “downbeat”, “dour”, “morose”, “lachrymose”, and probably some other words I can’t think of at the moment because I don’t have immediate access to a thesaurus. 2:55 – I’m sure that guitar note in the right channel was intentional, to signify the sadness in the song, but I thought it was just a bad note. This is a bit more upbeat. Thank you, band. When the singer sings about having read the news “I read the news…”, as do other singers from time to time in other songs, guess what song I inevitably think of? I have a feeling the drummer likes the drum beat in this song, because he uses a remarkably similar one in track 3, “So Right It Can’t Be Wrong” (see above). 0:39 – Nice guitar chord. 0:39-0:43 – Where have I heard that vocal melody before? 2:46-2:49 – And where have I heard that guitar lick before? There’s that drum beat again. I like the sound of the whatever-it-is in the right channel from 0:01-0:10 (and elsewhere). Is it a hammered dulcimer? I thought the chords played by the guitar in the right channel from 1:34-1:36 were a bit cheesy. I’m enjoying this one. It’s perkier than pretty much every other song on the album (excerpt, perhaps, for the first track), and I’m finding myself drawn to it in a “Hooray! A bit of sunshine on a slightly dreary album!” way. Another perky song. This is much better. It’s chock full of “doo doo, doo-doo-doo”s, and for me that’s a good thing. And I liked the little laugh (3:18-3:19) to end the album. The songs don’t have as much variety as I thought it was going to have. Being a sort-of concept album, I had thought that stylistically it was going to be all over the shop. Thanks, chaps, for letting me know about The Time Machine Is Broken. And now if you’ll excuse me, I think I’ll listen to it again – but this time a little less pickily. A proper review of the album at Ice Cream Man Power Pop And More! You are currently browsing the archives for the Strangely Alright category.